Eating Potting Soil | Just another weight loss blog..
Just another weight loss blog..
Wow, I haven’t updated in so long! I was doing pretty great this year, and through the summer. I started swimming and it was great.. I coached my son’s soccer team. Around September/October I started feeling really lethargic and crappy a lot. Well, we found out why on Halloween, we are expecting a little boy! I decided I really needed to get back on the wagon, but have been feeling pretty sick and had the flu for about 2 weeks. I havne’t worked out in about 4 weeks and have to get back to it. I’ve decided to get back to the paleo way of eating, and back into swimming, spinning, dancing and anything else I can do. I had gotten down to 265 before getting pregnant and I’m back to about 280. Oops.. I have not updated in awhile..
Well, I’m back on track.. I really played around with the month of March, but we were very busy.. Had my son’s birthday, my birthday, my sister’s baby shower, and then we went on vacation. My weight is 274, so only about 6 pounds since I last updated… but I’m getting back on track. I’d like to really lose another 15 by May 5, which is my friends Engagement Party, and I’d like to be able to get a new outfit. Though I haven’t lost a lot of pounds, I’ve definitely been losing inches still, and working out. I’ve started doing some crossfit WOD’s on my own, not just with Van and Sara. 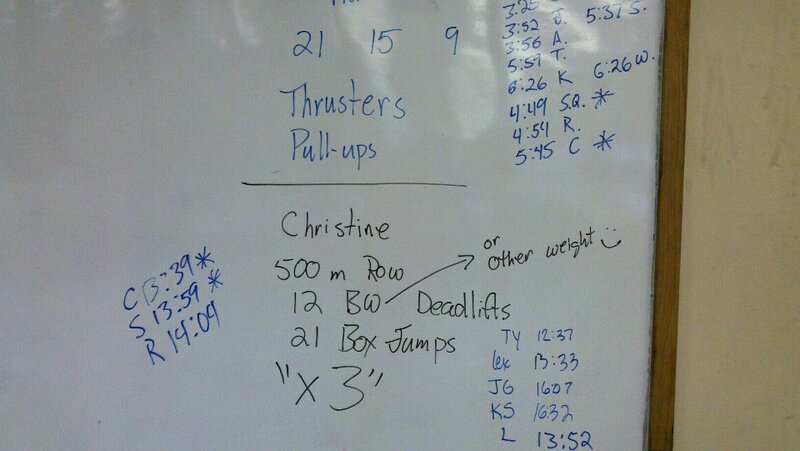 Monday was a 60 minute spin class (race day) and then the WOD, which was 225lb back squats and 1.5 pood kettlebells. I subbed 85lbs and did deadlifts and 25 pound kettlebells, took me about 11 minutes. My back was so tight! Wednesday, I did a 45 minutes spin class, then 2k m row, which took I did in 10:06. Thursday, I did a couch to 5k walk/run (Week 1, Day 2). I absolutely love the app, it is so cool, it tracks you by GPS, and you can see how far you ran, where and how fast/long you did it. I did a 14:50/mile and 2.02 miles in 30 minutes. Friday, I did C25k (Week 1, Day 3) in 2.06 miles, and 14:32/mile. I will be posting more often, have to keep it in mind, so I can keep track of my workouts! I’m starting to see some big changes in myself, and it is so exciting.. My clothes are getting so loose, and my body is starting to change.. 280.5 this morning.. I think this weekend will be when I get into the 270’s. After that, I walked on the treadmill @ 3.2 for 70 minutes and went to happy hour yoga later in the evening.. I burned approximately 899 calories today. It was a pretty good day! Row 1k, 25 wall ball, 16 lbs. I can’t believe how ridiculous and immature people can be. Especially people ‘well advanced’ in their years. I also can’t believe how people would want others to fail, even as far as something like taking care of their health or losing weight. I’ve been upset or mad and wanted to cuss someone out, but I really hope the best for everyone around me. Though there has been times I felt like I ‘hated’ someone, I really don’t hate anyone..
Now, I have to be very careful about my time. I decided I won’t take any more lunch time, so that I’m not lied about at work. I just can’t believe it would come down to that. I was SO happy this morning when I saw 281.5! 17.5 pounds lost since Jan 1. I feel fantastic. I’m so proud of how I’ve been able to not overeat or stress eat or eat out of boredom. Tuesday, I went to a 90 minute yoga. It was amazing. I was able to “turn my dog” on my left side. Very exciting stuff! My calorie total was 1473. Tonight, I went to spinning. I’m ending tonight’s calories at 1664. So I did hit 284 briefly.. but am up a pound to 285. Last Thursday, I did water aerobics, and on Friday, Sara and I met in the early morning a workout with Van. We did our first Fran and Christine.. My times were Fran 5:45 and Christine: 13:39 (mostly step ups instead of straight box jumps. Saturday and Sunday, I was very lazy. I was sick last week, and over the weekend, and I just was crampy and not feeling great. I didn’t have too much energy either, so I really took it easy. I was so excited for today.. which was totally ruined.. I was very excited to start my swim class for triathlons today.. but it was ruined. My coworker was mad that I had left to go to the gym (????) and went to my supervisor to tell on me. She lied and told her I was gone for over 2.5 hours, but I wasn’t gone that long. So basically, I was told that we only really have 30 minutes for lunch. This puts a huge crimp in my workout plans. I normally go to the gym twice a week at lunch to get a spin class in or some extra cardio. So because of this.. I guess I can’t really work out at lunch. What I think I WILL do is bring my stuff and at least jog or walk at lunch for 25 minutes. I’m bound and determined. I will NOT let someone make this so I can’t get my calorie burn in. I’ve got to try to get some exercise in in the morning too, but that is very difficult, because I have to feed the dogs/get Alex ready for the day. I will not let this ruin me or my plans or my hard work. I WILL SUCCEED.